It just so happened that we were studying Hamlet in my English class during my senior year of high school when this, the last Star Trek film to feature the entire original cast, was released. And I’ve always thought that the above quote would have been perfect presented just after the dedication to Gene Roddenberry but before the fade in on the star field for the opening credits. Would it be a reference to death itself, or to the fear of the future world that awaits our heroes’ posterity? Even without it though, the reference was not lost on me (or any of you I’m sure). In the two and a half years between the release of Star Trek V: The Final Frontier and this film, much had changed in my life. In the summer of 1990, my brother Dan and I, now that we were teenagers, decided that after 11 years with my mother and stepdad, we decided that it was Dad’s turn to have a shot at raising us the rest of the way and we went to live with him. So we went from Hamburg, New Jersey to Crestview, Florida, about 30 miles from my dad was stationed at Hurlburt Field. For me, it was a fresh start. After a painfully awkward freshman and sophomore year in New Jersey, my (then) stepmom had bought me some pretty fashionable clothes and allowed me to make a good first impression at Crestview High School. For the first time in my life, I was one of the “cool kids”, but even with my rather normal interests in sports and girls, I never lost my affinity for Star Trek. Things seemed to turn around for the franchise as well. “The Best of Both Worlds” represented a turning point for our stalwart new heroes from Star Trek: The Next Generation. Before this spectacular cliffhanger and two-parter, TNG could hardly do anything right in the eyes of many fans; after it, they could do no wrong. The Next Generation had proved themselves as far more than a cheap carbon copy of the original and were now fully acknowledged as the living breathing version of Star Trek. When I first heard that there was going to be a sixth film with the original cast, I must admit to having winced somewhat. As I had mentioned in my review of The Final Frontier, the visual flavour that I had loved from the early movies felt very much gone and I too had come to accept TNG as the Star Trek that should be allowed to continue unfettered. However, when I read that Nicholas Meyer would be returning to the director’s chair, I became excited. I knew that he was the man largely responsible for the making The Wrath of Khan such a success and became hopeful that he could once again rescue the original crew and help them go out in style. Happily, it turned out to be a hope that was well founded. The 25th anniversary of Star Trek’s premiere was coming up, and it provided Paramount with the perfect excuse to green light one last adventure for the now-classic original cast. Harve Bennett had wanted to do a prequel film about Kirk, Spock, and McCoy’s first meeting each other at the academy in a sort of “Top Gun in outer space” adventure that William Shatner and Leonard Nimoy would tell flashback style, but this idea was axed by the studio. (This concept would have to wait another 18 years for Leonard Nimoy to see off said new cast.) 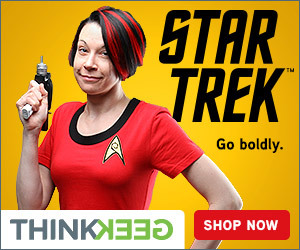 This caused Bennett to finally leave the Trek fold after a nearly ten-year involvement. With Bennett now gone, Leonard Nimoy took over as executive producer at Paramount’s behest and began brainstorming ideas with Meyer about what would make a great final story for our heroes. Noting the recent end of the Cold War, the fact that the Klingons were now presented as the Federation’s allies on TNG, and that the Klingons were always the Cold War allegory villains, Nimoy thought of a story about “the wall coming down in space” and Kirk and company spearheading the path to peace as an appropriate last adventure. Meyer liked it, and came up the idea of conspiracies against and assassinations of politicians on both sides by those “who stand to lose from peace”, regardless of what side they were on. The opportunities for character drama were enormous and they had the story and momentum they needed. 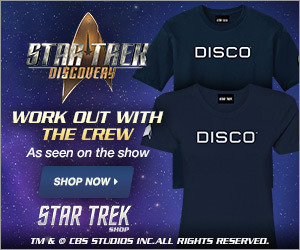 However, despite having come up with the overall story, Nimoy would not be getting in the director’s chair again. Remembering how exhausting directing AND acting in The Voyage Home was and not wanting to risk alienating his co-star and friend William Shatner, he decided that Nick Meyer, who was a proven screenwriter and director for the franchise, was best qualified to deliver this film. If anyone could do it in this short time and on a limited budget, no question… it was Meyer. As before on TWOK, Meyer made use of existing sets and knew how to make cost-cutting work behind the scenes that would not affect what was seen on the screen. The shoot may have been lean and mean but it wasn’t easy. With location shooting on frozen glaciers and bouncing back and forth between there and Hollywood, it is a testament to Meyer’s management skills that he could deliver such a high-quality film on a budget not much more than that of its predecessor (only about $4 million more). William Shatner, Leonard Nimoy, and DeForest Kelley all took cuts to their salaries in exchange for a percentage of the grosses in the hope that it would result in a better film that would be a bigger hit and it paid off. The story begins with the bulk of our heroes preparing to retire from their service aboard the Enterprise. The lone holdout is Hikaru Sulu, who is now the captain of the U.S.S. Excelsior. The story literally opens with a bang, one powerful enough to knock Sulu’s new command off of their rocker and catapult the Klingon Empire into a major crisis that could mean the end of their civilization as they know it. 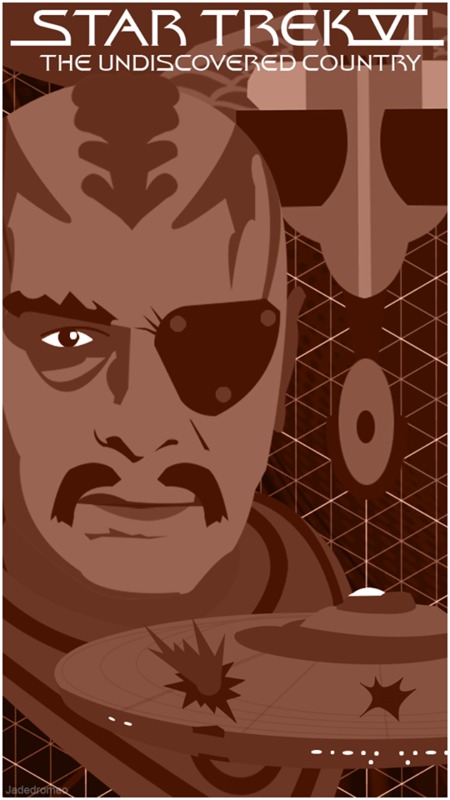 One Klingon, however, sees an opportunity; the Empire’s Chancellor, Gorkon (David Warner). Named for real-life Soviet Premiere Mikhail Gorbachev and sporting a beard that evokes the goodwill of Abraham Lincoln, the chancellor gets together with Captain Spock (with a little help from Sarek) to get a peace initiative going that will finally put their own cold war to rest. Kirk is actually appalled by this idea, which is very interesting. The Kirk we know from the third season of TOS would have been in favor of a peace initiative with the Klingons, but more recent events- most notably the death of his son, David, at the hands of Klingons- have hardened his heart to where he swears that he would never trust them, and wouldn’t shed a tear over it if they were to go extinct. At least he doesn’t think that he would- as Kirk and the other characters go through their arc which involves a conspiracy and the assassination of Chancellor Gorkon for which he is implicated, tried, and sentenced to life imprisonment (along with Dr. McCoy), our heroes come to realize again what they once knew before- that the greatest threat to humanity is ourselves and our fear of what lies ahead. Those who overcome their prejudice (on either side) will enjoy the peace that follows the battle to keep it. Those who refuse to change either bite the dust or face imprisonment themselves. The conspirators are an interesting bunch. Only one of them is the one that we would actually expect to be in on it and that’s General Chang (Christopher Plummer). 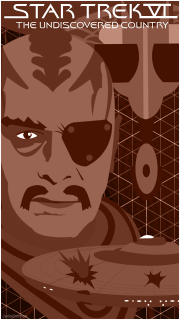 Chang is a most unusual Klingon character, however. Instead of the usual Targ-drumstick chewing, bloodwine drinking space Viking that has been the prototype for pretty much all Klingon characters since Christopher Lloyd established this mould in The Search for Spock, Chang is actually articulate and well-mannered and liberally quotes Shakespeare just as a means to get under Kirk’s skin. He’s obviously badass enough (as evidenced by the eyepatch bolted to his skull, which I always loved), but more than that, he’s cunning enough that he’s not even above playing the victim to make Kirk suffer behind bars. And who are his fellow conspirators in this dastardly conspiracy to kill his own chancellor? Brigadier Kerla? The ambassador from The Voyage Home? His daughter, Azetbur? Nope! Meyer, ever the great writer, knew that that would be too easy. Chang’s conspirators would be found within…gasp…the Federation! Admiral Cartwright (Brock Peters), who was definitely on our side in TVH, Colonel West (Rene Auberjonois), who is revealed to be the Federation President’s would-be assassin (in the extended version anyway), and even members of the Enterprise crew, led by Valeris (Kim Cattrall), a Vulcan woman whom Spock sponsored to the Academy. Valeris is the most interesting of all, as this was originally supposed to be Saavik. For various reasons, it wound up not being Saavik and to be honest, I’m grateful for this. In one of his last bits of “executive consulting” for the movies before his death, Gene Roddenberry had recommended against the use of Saavik to betray out heroes as he felt that she had achieved “beloved character status” and the audience would also feel betrayed. Of course, Meyer argued that that was the whole point. Let’s be honest, we would NEVER have thought that Saavik would be a conspirator and we would indeed feel the betrayal just as our heroes did. As it turned out, Kirstie Alley was no longer available to reprise it and Meyer didn’t want Robin Curtis or anyone else playing Saavik, so he created a similar character and went to Kim Cattrall, one of the runners-up for the Saavik role nine years earlier, for this role. All in all, I believe it worked out for the best. I can remember rumours flying about at the time that this film would see the death of Captain Kirk. Given his lack of presence in the TNG era, Roddenberry’s comments that Kirk probably was dead by TNG’s time, and a reference in the TNG two-parter “Unification” (which Leonard Nimoy did to help promote this film) about the “consequences to [Kirk] and to his crew” during this mission, and even a shot in the trailer of Kirk being disintegrated, the question of Kirk’s survival did indeed hang in the balance. Although easily forgotten today, it did up the ante of excitement at the time. Just as our heroes faced the “undiscovered country” of an unknown future in the film, I- preparing to graduate from High School- was also facing a new and uncertain future that could be both frightening and exciting at the same time. Once again, we have a theme that can be carried with us all through every stage of life. Every time we come to an end of an era, we can choose to react either with fear and resistance OR with acceptance and wonder. As Spock said, we must have faith every time a turning point comes in our lives and in the world around us and allow it to unfold, as it should. I always have and always will love it when we get introspective thoughts like this in the middle of a film chock full of space battles and adventure. The end battle does not disappoint in the slightest nor does Kirk’s triumphant speech, in the end, he and the new Chancellor Azetbur restore each other’s faith. The road has been paved for the peace that The Next Generation enjoys and best of all, the Enterprise, battered but triumphant, sails away into the brightness of a star as Kirk records his final log and the original cast literally signs off. It’s the perfect ending for 25 great years together and the promise for a great future, even in the wake of the passing of Star Trek’s creator. On the one-to-ten scale, Star Trek VI: The Undiscovered Country gets a 9, the lack of Harold Michaelson’s original visual flavour from the sets is the ONLY thing keeping it from a 10, but Meyer still throws in some nice nautical touches. From the release of Star Trek: The Motion Picture when I was in kindergarten, to this film’s release during my senior year, I can honestly say that I literally grew up with these films, and the fact that they were probably the only films make during the 1980s that made it okay for our heroes to be older helps them to live long and prosper all throughout our lives.